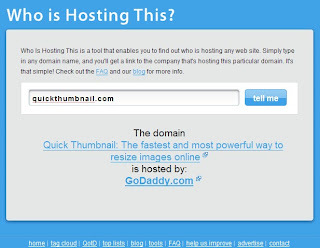 Who Is Hosting This is a tool that enables you to find out who is hosting any web site. Simply type in any domain name, and you will get a link to the company that is hosting that particular domain. It is simple and also quickly. 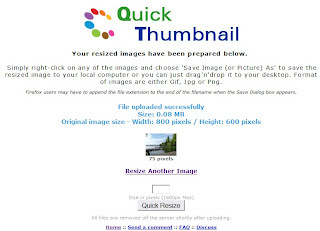 Quick Thumbnail is a fast way to resize your pictures and images online. Choose an image file, select some resize options, and hit Resize it. Your image will be uploaded to the server, resized and then your resized image will be viewing. You can click it to save into your computer. 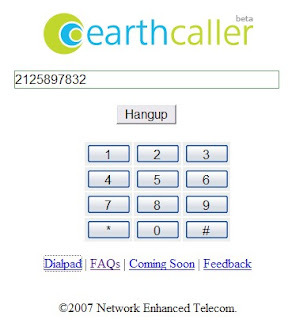 Earthcaller is an online voip server, that allows you use browser to call regular phone in US for free. It sounds cool but I have never get connection. The website says it will open to international phone call in the future. If somebody interest this service, try it and tell me how.